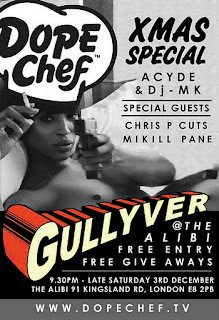 Dope Chef has Teamed up with Gullvers Dj’s MK (kiss 100) ACYDE (Trading Places) and Chris p Cuts for their monthly jam at the ALIBI in Shoreditch for a Christmas special after party for the Dope Chef Boat pop up store. The Party Kicks of on Saturday 3rd December from 9.30pm till late featuring Special Guest ‘MIKILL PANE”. This thought provoking lyricist will be at hand to deliver mean bars while Dope Chef spreads the Love with Free Give aways on the Night… with free entry as well so arrive early before the spot gets packed to avoid disappointment.